The best HR Qualification at an introductory level - it will advance your career. Delivered by tutors who advise the HR teams of Britain’s biggest companies. This course gets you work ready. The best HR Qualification at foundation level - it will advance your career. Delivered by tutors who advise the HR teams of Britain’s biggest companies. Superb practical course that gets you work ready. On completion learners earn professional status and the letters ‘Cert HR’ after their name. Book your place now! World-Class learning content that is more practical than other HR courses. On completion you earn the letters Cert HR after your name. The course is designed for business growth and business protection. Our tutors advise the HR teams of Britain’s biggest companies & government. You become qualified for a career in HR and In-House Recruitment. Delivered in a much higher quality learning environment. This HR course is designed for business protection and growth. This course is at Level 3 (Foundation Level) & takes 3 months to complete. Those currently working in HR. Those interested in a career in HR. Anyone seeking accreditation from a recognised HR Institute. Any person with people management responsibilities (such as line managers, office managers, assistants, team leaders and supervisors). Those taking this qualification may have roles such as HR Administrator, HR Assistant, Branch Manager, Team Leader, Line Manager & In-House Recruiter. Companies looking to employ HR Administrators/Assistants. Companies looking to employ In-House Recruiters. This includes both Public and Private sector organisations. This course is officially recognised. On completion learners earn IOR Membership and the professional letters ‘Cert HR’ after their name. No prior entry qualifications are required for this qualification. If you do have experience then great, as this course will serve as a useful update and refresher. You will undertake some self study online activities in your own time at your own convenience. Your learner’s workbook will give you instant access to all the learning materials and exercises you need to study. You will be assessed by 1 assignment per unit with no exam. The qualification takes 3 months to complete and is designed for people who may be working or have other commitments. This course is officially recognised. On completion learners earn IOR Membership and the professional letters ‘HR Cert’ after their name. 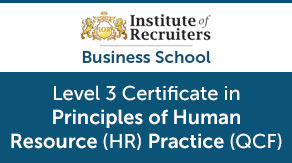 Learners gain a Level 3 Certificate in Principles of Human Resource (HR) Practice (QCF)​. This is a recognised British qualification designed for Human Resource Professionals and regulated by OfQual, Britain’s qualification regulator. Level 3 is classed as an foundation level qualification, so as your career progresses you may want to consider the intermediate and higher qualifications. Support via your free IOR membership. No. The qualification is assessed using assignments. The qualification is designed to be practical and enjoyable. Do I get professional membership or a HR industry body? Yes, you get free full membership of the Institute of Recruiters (IOR) and earn the letters 'Cert HR' after your name. The IOR is a Professional British Institute providing qualifications, short courses, guidance and training to those working professionally in Recruitment & HR. It offers membership to individuals with benefits and support.